Large (up to 4 in. 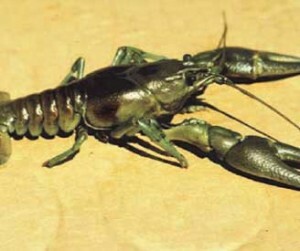 ), aggressive crayfish whose color is variable, but consistently has large, rust-colored spots on either side of the shell and black bands on the claw tips. Found in freshwater lakes, rivers, and streams with rock, gravel, clay or silt bottoms. Prefers deep pools and fast currents with cover such as rocks, logs and debris to protect from predators. Found in a couple of lakes in Omaha, NE, the Gavin’s Point tailwater area and in the Missouri River. Introduced via aquarium dumping, release or escape of unwanted crayfish from bait buckets and fishing lines, releases of those used in science classrooms. Eats and damages stands of aquatic plants, reducing food sources and aquatic habitat for aquatic invertebrates and fish. 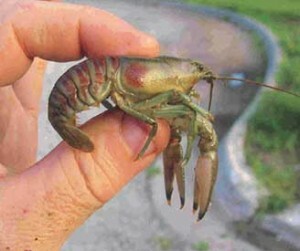 Often out-competes native crayfish for food and habitat and negatively impacts fish populations through competition for food and predation on fish eggs. With their strong claws and aggressive nature, they can also pose a menace to swimmers.